Sometimes you buy an album that speaks to you. No, literally, it speaks TO YOU. Each song has something to say about your life. It reaches out from the speakers and clasps you tightly until the last note has faded away. It conjures up everything you have ever thought and felt and said and wished and longed for. Enter, stage centre, The Queen is Dead. An album that is so damn good it aches. From the outrage and music hall splendour of the title track (‘take me back to dear old Blighty’), the camp joy of ‘Vicar in a Tutu’ (‘he’s not strange, he just wants to live his life this way’) to the aesthetic delight of ‘Cemetry [sic] Gates,’ (‘Keats and Yeats on your side, Wilde is on mine’), it was an album that, from the first, left me speechless; apart from those endless hours when I was gushingly telling everyone that I’d found God and his name was Morrissey. It is a mournful album, a tragic album, but most importantly an extraordinarily hopeful album, especially for everyone who felt that contemporary music didn’t understand them. 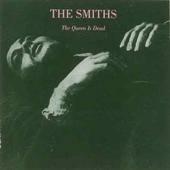 Perhaps most poignantly, most memorably, The Queen is Dead is also the album that contains the Mount Everest of all love songs: ‘and if a double-decker bus crashes into us, to die by your side is such a heavenly way to die.’ ‘There is a Light that Never Goes Out’ is the cherry on the top of the bowl of cherries on top of the cherry cake. Baked by a girl called Cherry. With cherry blossom in her hair. If you haven’t cried listening to that song until your sinuses began to bleed then frankly you have idea what love is. At all.